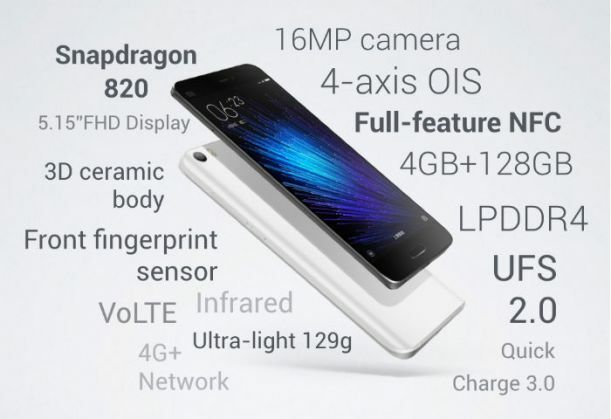 Home » tech news » Xiaomi Mi 5 unveiled: Here's your sneak peek! Xiaomi launched the Mi 5, the latest flagship smartphone from the Chinese tech giant, on 24 February at the Mobile World Congress 2016 in Barcelona. In a pre-scheduled launch event, the firm's vice-president Hugo Barra entered the hall on a hoverboard with the Xiaomi mobile's factory-set ringtone playing in the background. Barra displayed black, gold and pearl-white coloured smartphones at the MWC 2016.The company claims that the phone - which took two years to make - was designed in a 16-step process.The sleek Mi 5, which has curved edges, looks a little like the Mi Note. However, the Mi 5 comes with a 5.5-inch screen and a fingerprint sensor on the front of the phone. The camera is tucked into the design, unlike its other siblings. What's more, the speakers and camera of the Mi 5 are perfectly centred unlike flagships of Samsung and Apple iPhone 6s series. The Mi 5 sports a smaller 5.15-inch Full HD screen, with sunlight control, that will give a feel of 5-inch screen, Barra said at the event. The phone weighs 129 grams - much lighter than Apple's iconic iPhone 4s. Despite the lighter weight, the Mi 5 comes with a high-density 3000 mAh battery. The optical image stabilisation camera is one the main USPs of the Mi 5, Barra said while launching the smartphone. "We have taken it to an entire level with four-axis OIS," Barra said. This means the device will enable you to click steady photos even if you move your device or if the object is moving in any direction while clicking the photograph. The 16 MP rear camera comes loaded with a Sony IMX 298 sensor, which prevents light from leaking into and distorting the photograph. The front camera is 4 megapixel, similar to that of the Mi Note.